For products designed with LED backlighting, graphics can be shown sharply using laser etching technology. Laser etching allows to create the legends for keypads with backlight application. It gives a high design flexibility and saves costs for plastics. 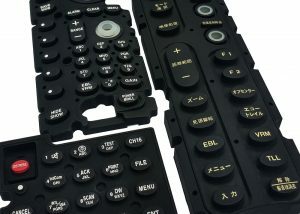 Laser Etched rubber keypads require to PU or Silicone coating to enhance the lifespan of the legends Suggested to apply PU coating which is optimal performance.